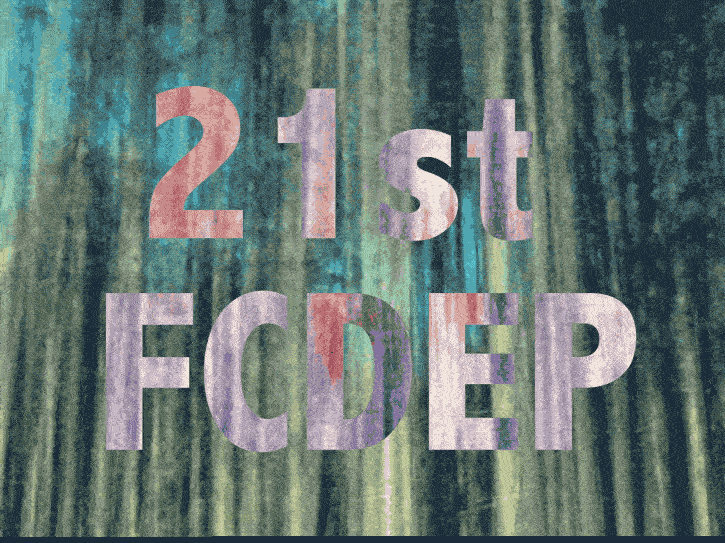 Call out for films and videos submissions for the upcoming 21st edition of Paris Festival for Different and Experimental Cinemas (October 2-13, 2018). The festival is organised by Collectif Jeune Cinéma every year. CJC - Collectif Jeune Cinéma - was founded in 1971 following the New York Filmmakers's Cooperative footsteps. CJC is a cooperative for distribution with the aim to promote visual and cinematic experimental practices. Along with the organising of regular montly screenings, CJC is also the organiser of the Paris Festival for Different and Experimental Cinéma. Call out for films and videos submissions for the upcoming 20th edition of Paris Festival for Different and Experimental Cinemas (October 2018). The festival is organised by Collectif Jeune Cinéma every year. CJC - Collectif Jeune Cinéma - was founded in 1971 following the New York Filmmakers's Cooperative footsteps. CJC is a cooperative for distribution with the aim to promote visual and cinematic experimental practices. Along with the organising of regular montly screenings, CJC is also the organiser of the Paris Festival for Different and Experimental Cinéma. If you are younger than 15 years old and you have already made or wish to make a film, the Collectif Jeune Cinéma gives you the opportunity to participate in an international experimental film festival. The films submitted must be at least one minute long, up to less than one hour. 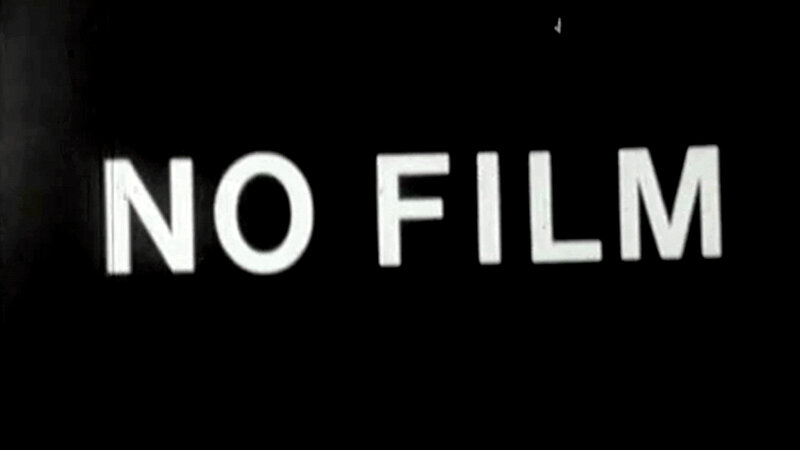 There is no imposed theme and you are not obliged to tell a story. Call out for films and videos submissions for the upcoming 19th edition of Paris Festival for Different and Experimental Cinemas (October 2017). The festival is organised by Collectif Jeune Cinéma every year. CJC - Collectif Jeune Cinéma - was founded in 1971 following the New York Filmmakers's Cooperative footsteps. CJC is a cooperative for distribution with the aim to promote visual and cinematic experimental practices. Along with the organising of regular montly screenings, CJC is also the organiser of the Paris Festival for Different and Experimental Cinéma. 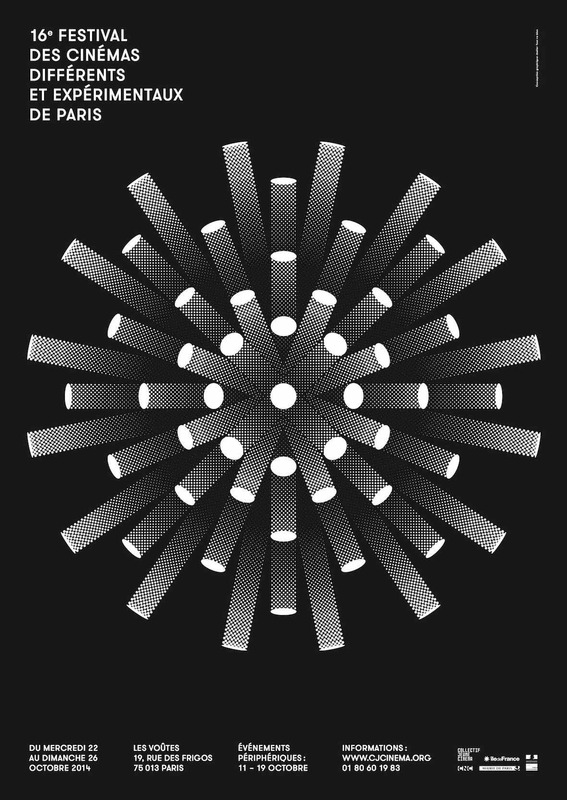 The 18th edition of the Paris Festival for Different and Experimental Cinemas presents six competitive programs and a series of peripheral events around the theme "Humor & Facéties".The surrealists used to find their daily inspiration in cinema, although not in the serious productions, but more in burlesque films or in extravagant serials. This explains the strong presence of the extraordinary and rip-roaring dimensions in avant-garde films. 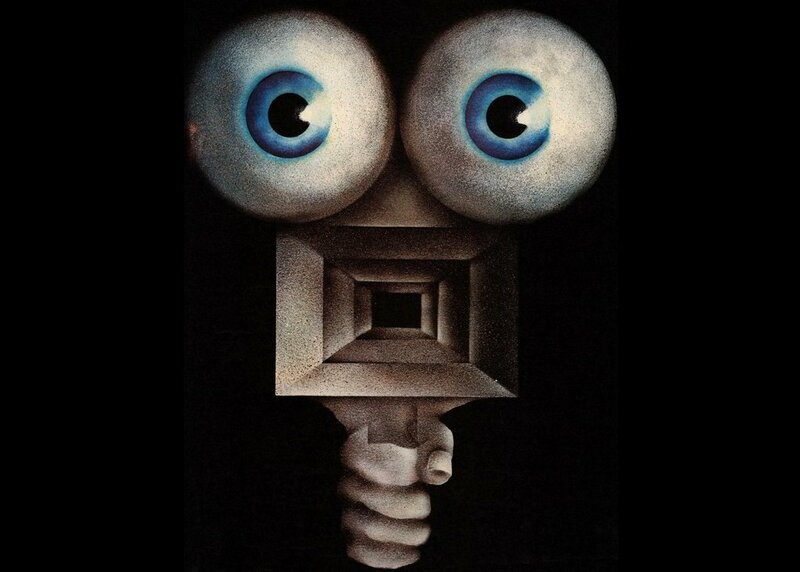 Many experimental filmmakers after them kept and nourished this taste for humour. For this year's edition, we invite our audience to discover this domain -the less austere of the vast world of creation- through different focus events. If you are younger than 15 years old and you have already made or wish to make a film, the Collectif Jeune Cinéma gives you the opportunity to participate in an international experimental film festival. The films submitted must be at least one minute long, up to less than one hour. There is no imposed theme and you are not obliged to tell a story. A sensation, an impression, images that you find beautiful or interesting, your desire to try a specific kind of editing or to narrate in your own way without fearing imperfection or failures of the sound and image, a game with shapes that inspire you: all of these are some of the multiple possibilities to start to make your own film. Call out for films and videos submissions for the upcoming 18th edition of Paris Festival for Different and Experimental Cinemas. The festival is organised by Collectif Jeune Cinéma every year. CJC - Collectif Jeune Cinéma - was founded in 1971 following the New York Filmmakers's Cooperative footsteps. CJC is a cooperative for distribution with the aim to promote visual and cinematic experimental practices. Along with the organising of regular montly screenings, CJC is also the organiser of the Paris Festival for Different and Experimental Cinéma. Today, CJC's catalogue includes more than 1200 films from more than 300 filmmakers. The Paris Festival Of Different & Experimental Cinemas opens for the first time a competition for filmmakers under 15 years. Experimental cinema is first the pleasure of inventing images and original sounds, total freedom to make films that do not necessarily tell stories, play with shapes, colors, music, mixtures of techniques and images of any kind. 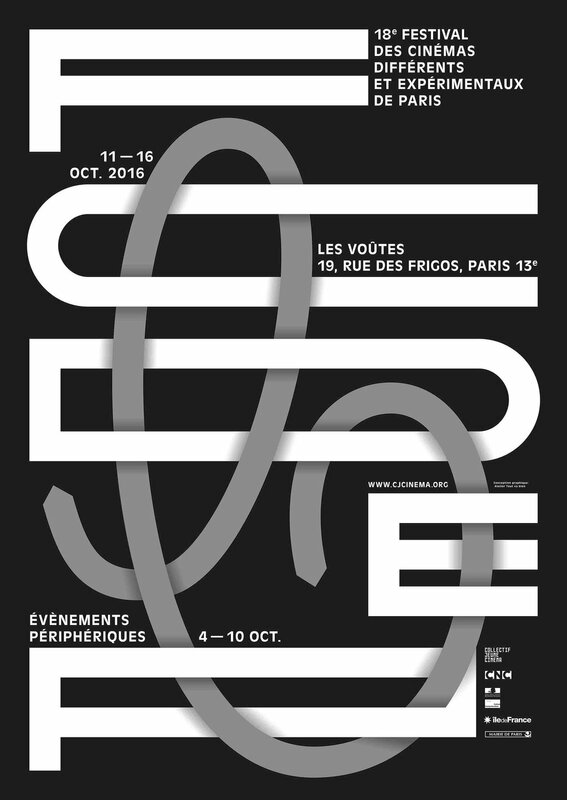 The selected films will be projected at the 17th Paris Festival Of Different & Experimental Cinemas to be held at voûtes (Paris 13th) of 14 to 18 October 2015. 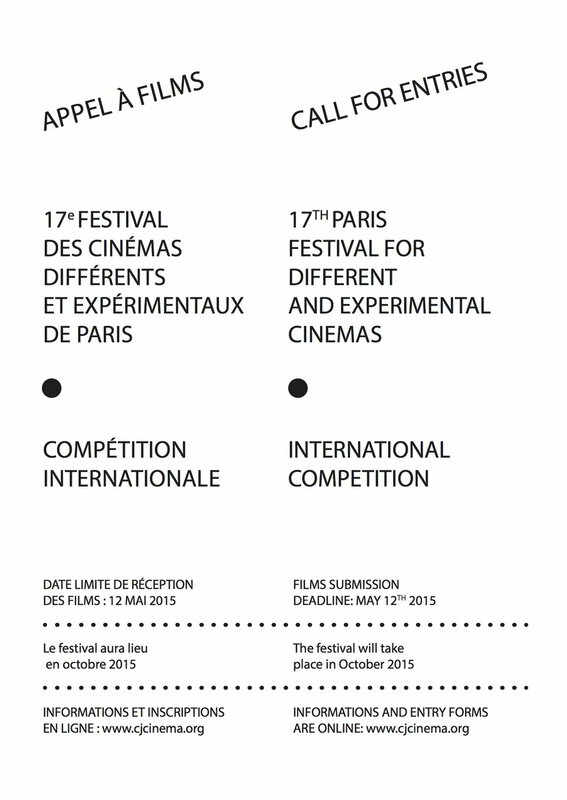 Call out for films and videos submissions for the upcoming 17th edition of Paris Festival for Different and Experimental Cinemas. The festival is organised by Collectif Jeune Cinéma every year. CJC - Collectif Jeune Cinéma - was founded in 1971 following the New York Filmmakers's Cooperative footsteps. CJC is a cooperative for distribution with the aim to promote visual and cinematic experimental practices. Along with the organising of regular montly screenings, CJC is also the organiser of the Paris Festival for Different and Experimental Cinéma. Today, CJC's catalogue includes more than 1200 films from more than 300 filmmakers. The 16th edition of the Paris Festival for Different and Experimental Cinemas will take place in Paris and nearby from the 11th until the 26th of October. On top of the presentation the International Competition programs made out of a selection of 58 films from 25 countries, this edition will focus on the relations between music and experimental cinema. We will have the great pleasure to welcome many filmmakers (Martha Colburn, Patrick Bokanowski, Patrice Kirchhofer, Robert Cahen, Xavier Christiaens,...) and musicians (Scorpion Violente, Magic Malik, Joana Preiss, Alexandre Yterce, Lionel Marchetti, HeadWar,...) who will intervene during 13 screenings, cine-concert, performances, installations and public discussions.